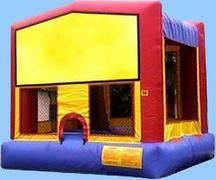 Finest bounce houses in town, available for parties, etc. Need more than 50 servings of cotton candy? No problem, we sell additional servings in quanities of 25 for only $20. If you want 50 additional cones, put a "2" in the check out section. Need more than 30 servings for the popcorn machine? Only $.50 per serving, order as many as you like. If you want a total of 50 servings, then you must put '20' in the quantity section. A supply is popcorn, salt, butter and bag. 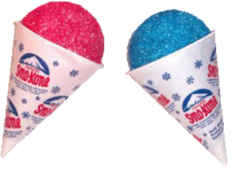 Need more than 50 servings for the snowcone? Only $15.00 for 25 additional servings. If you want 50 additional servings, just place "2" in the quantity section. A serving is syrup and cone. What little girl doesn't want to be a ballerina? 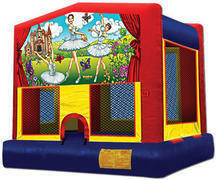 Large Ballerina Bounce House Great for parties and events of all sizes. 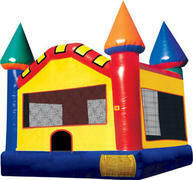 Large Bounce Castle Great for parties and events of all sizes. The large bounce castle has a total weight limit of 800 pounds! 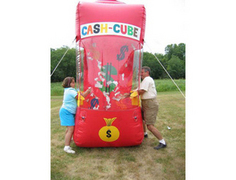 Make your guest feel like a million bucks with this cash cube. You can either battle against another person, or play alone. Our 4 and 1 combo offers up to four different activities for hours of activity. 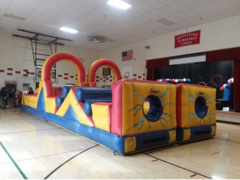 It has a large interior jumping area with a safety ramp at the entrance and high-visibility windows that allows friends and family to keep an eye on participants, a basketball hoop for group interaction, a padded climb and a fast slide. Our 4 and 1 combo offers entertainment for even the most active child! 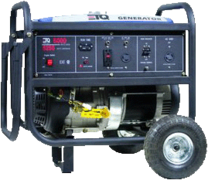 1400 Watt Generator. Gas can last up to 8 hours. Customer must fill with more gas if event is longer than 8 hours. Bring the popular Hello Kitty to your next party. Large Hello Kitty Bounce House Great for parties and events of all sizes. 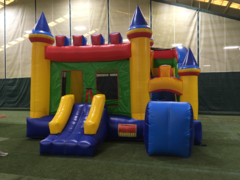 Large Fun HouseGreat for parties and events of all sizes. The large fun house is 15 x 15 and has a total weight limit of 1,000 pounds! This huge slide will be a hit for any event. Coming in at over 20 feet tall, kids of all ages will enjoy climbing up one side and then taking a fun ride down. Looking for something new and different to add onto your next party? 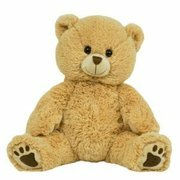 Make-a-friend is the perfect addition, pick from our most popular friends, bears, panda, frogs, unicorn and more. We will provide you with the "friend" and the materials to stuff with. Great activity to add on to the party and gives everyone something to take home. Only $9.99 per friend, so if you want 10 kits make sure to change the quantity to 10. Pump It Up! Your young & old Bball player's are going to love this hoops game. Challenge your friends to a quick competition to see who can make the most baskets in a minute. You won't need to chase the ball around because this game includes a ball return for continuous play. Mini All-Stars Basketball includes: 2 Basketball Hoops and 4 Basketballs for Fun & Competitive Playing. Great for all ages! 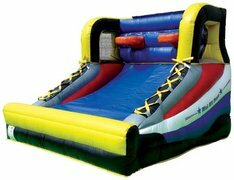 Large Bounce House great for parties and events of all sizes. 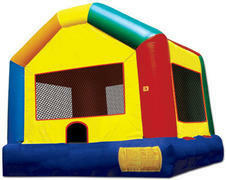 The large bounce house is 15 x 15 and has a total weight limit of 1,000 pounds! This obstacle course is a hit for any event. It's perfect to race side by side with over 40 feet of excitement with activities for everyone. Obstacle course includes a climbing wall, slide and obstacles to go around. Who doesn't love Planes? Large Planes bounce house. Popcorn machine complete with supplies for 30 people. Sno-Kone machine complete with supplies for 50 people. You just need to supply the ice.